Moving the Needle: Russell Martin draws a walk to bring in the go-ahead run, +.324 WPA. A.J. Burnett had nothing, and it appeared that the Rays would get to him. But after scoring four in the first two innings they failed to score the rest of the way, giving the Yankees a chance to come back, which they did in the eighth and ninth. In the eighth they rallied to load the bases and brought home two runs to tie, and in the ninth they again loaded the bases. It started with an intentional walk to Nick Swisher, but that led to earned walks by Andruw Jones and Martin to give the Yanks a lead. Mariano Rivera finished off the Rays in the ninth and gave the Yanks the victory. Evan Longoria: 1 for 3, 1 2B, 2 BB. He drove in two in the first. Curtis Granderson: 2 for 3, 2 BB, 2 SB. Even when he’s not homering he’s getting things done. Moving the Needle: Nolan Reimold puts Baltimore ahead with a double, +.269 WPA. Really, does it matter who had the highest WPA mark of this game? 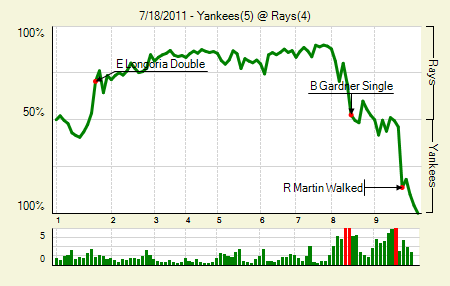 It was absolutely out of hand, as the chart indicates. First the Orioles led, then the Sox jumped out, then the Orioles re-took the lead, and then the Sox bombarded them with an eight spot in the eighth to officially render the game an embarrassment for the Orioles. They did save some face by adding another three runs before it was said and done. 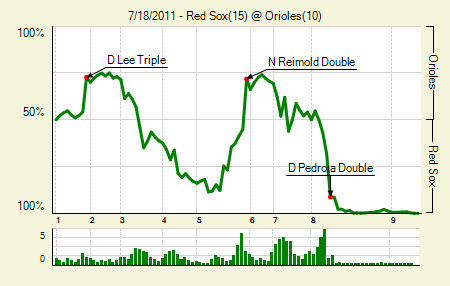 So yeah, Reimold did have the high WPA mark when he turned a one-run deficit into a one-run lead. But really, credit all the Sox in the eighth for turning this one around. Dustin Pedroia: 2 for 5, 1 2B. He drove in three, including the go-ahead run in the eighth. Dan Wheeler: 2.1 IP, 0 H, 0 R, 1 BB, 3 K. After Tim Wakefiled bombed he brought some order to the game. 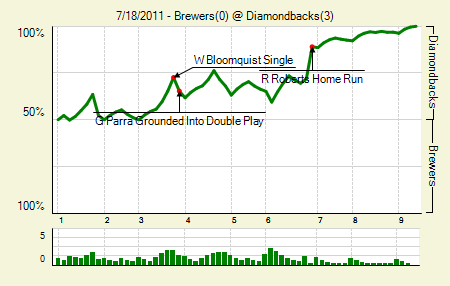 Moving the Needle: Ryan Roberts’s two-run homer gives the Diamondbacks a 3-0 lead, +.172 WPA. Just two events brought home runs in this bout. The first came on a double play ball with none out in the third, and the second came on a no-doubt shot by Roberts, his 13th of the season. Pitching dictated the rest of the game. Josh Collmenter: 8 IP, 3 H, 0 R, 0 BB, 7 K. He hit something of a rough patch previously, throwing 22.2 innings and allowing 19 runs in four starts from June 14 through July 1. But in his last two starts he’s thrown 15 innings and allowed no runs, walking just one to 10 strikeouts. The seven strikeouts is a high for his young career. Chris Young: 2 for 3, 1 2B, 1 BB. He doubled just before Roberts homered. 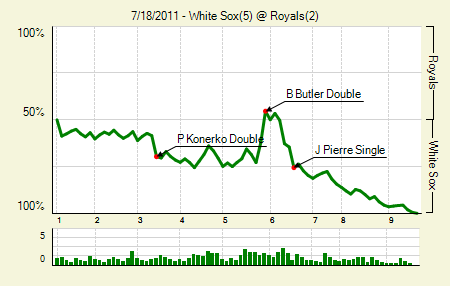 Moving the Needle: Billy Butler ties the game with a doube, +.168 WPA. In the fifth, down 2-0, the Royals put themselves back in it. A leadoff single and a sacrifice put a man in scoring position, and Melky Cabrera drove him home with a single. Butler immediately followed, crushing a double over Juan Pierre’s head in left, easily scoring Cabrera. The tie didn’t last long, though. The White Sox came back in the next half inning and put a pair on the board en route to their eventual victory. Mark Buehrle: 7 IP, 5 H, 2 R, 1 BB, 3 K. A typical Buehrle start amid a typical Buehrle season. 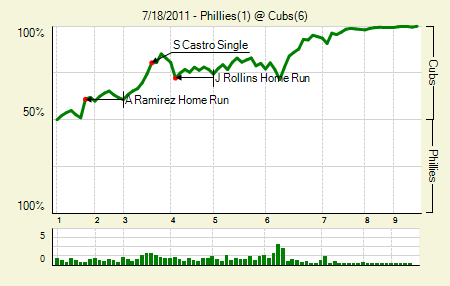 Moving the Needle: Aramis Ramirez gets things started with a solo homer, +.099 WPA. On this night Roy Hallday was vulnerable, and the Cubs jumped right in. Ramirez gave them a boost by lining one over the wall in left-center to give them a 1-0 lead in the first. They broke through for another pair in the third, though that was all they’d get off Halladay. He had to leave after facing one batter in the fifth, due to the excessive midwest heat. Carlos Pena: 2 for 3, 1 HR, 1 BB. He’s only helping his trade value with games like this. Rodrigo Lopez: 6.2 IP, 5 H, 1 R, 0 BB, 3 K. Apparently the entire Phillies team was feeling the effects of the heat. 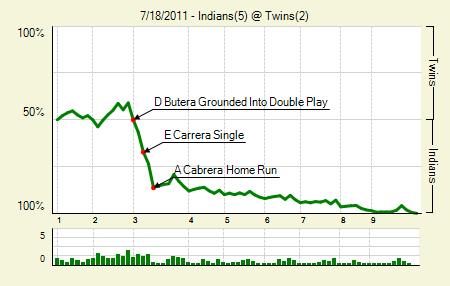 Moving the Needle: Asdrubal Cabrera‘s three-run shot extends the lead, +.128 WPA. Alexi Casilla’s error set the tone for the third inning. It allowed Lonnie Chisenall to reach, and then score when Ezequiel Carrera followed up with a single. After another single, Cabrera whaled a shoulder-high pitch deep into the seats in right to make it 4-0. Not another run would score until the ninth. Joe Mauer: 3 for 4. He has 19 hits this month, but just one has gone for extra bases. David Huff: 7 IP, 5 H, 0 R, 2 BB, 5 K. His last start in the majors, which came on August 8th of last year, was also against the Twins. That time he allowed five runs in 4.1 innings. Moving the Needle: Lou Marson breaks the tie with a homer, +.196 WPA. The nightcap of this twin billing was a bit more evenly battled, with the Twins taking an early lead, losing it, and then tying it again in the sixth. But in the seventh Marson led off with a big blast to dead center to break the tie. It was his first home run of the season, and to the deepest part of one of the league’s biggest ballparks. 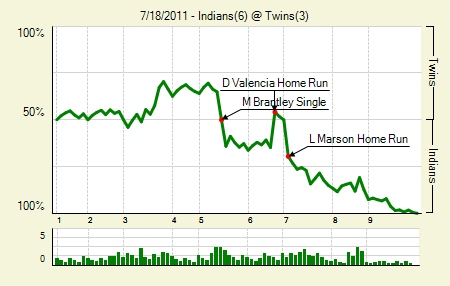 The Indians would tack on another before adding plenty of insurance in the ninth. Joe Mauer: 3 for 4, 1 2B. And now he has 22 hits this month, two for extra bases. Michael Brantley: 3 for 4, 1 2B. It’s surprising to not see him in center following yet another Sizemore knee injury. Moving the Needle: Todd Helton can’t pick up the throw to first and it costs the Rockies, -.159 WPA. Jason Hammel ran into some trouble in the second inning, but he had a way out of it. He allowed the first two runners to reach, loading the bases, but then he ran into some luck when Alex Gonzalez lined one to Mark Ellis, which allows the Rockies to pick the runner off first as well. That set up the intentional walk and brought the pitcher to the plate. Predictably, he grounded weakly, but Ty Wigginton threw the ball in the sun’s path. Helton lost it, and the ball sailed by him. 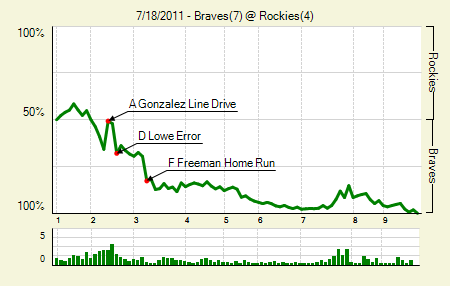 The Braves picked up a pair on the play, and then tacked on some more with a pair of homers in the next inning. Freddie Freeman: 3 for 5, 1 HR. Nine of his 14 homers have come since June 17th. Eric Hinske: 2 for 3, 1 2B, 1 HR, 1 BB. It’s pretty amazing how consistently good Hinske has been in part-time duty for the past four years. The only thing missing from his game this year is the walk rate. 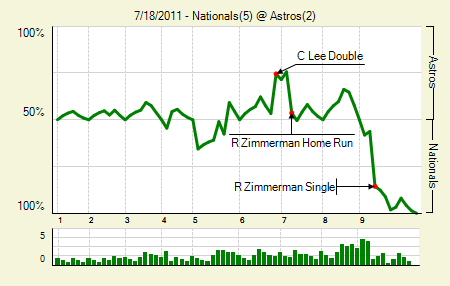 Moving the Needle: Ryan Zimmerman’s ninth-inning single breaks the tie, +.293 WPA. Twice Zimmerman contributed big hits in the game. The first came in the seventh, with the Nats down 2-1, when he laced one the opposite way for a game-tying home run. Then in the ninth he also went the opposite way, but this time it was a chopper through the hole, which scored Roger Bernadina from second. That gave the Nats the lead for good. Michael Morse: 3 for 4, 1 HR. The man is hitting bombs, and it’s not just this year. He and the Nationals seem to get along well. Carlos Lee: 2 for 3, 2 2B, 1 BB. He drove in a run, and like every other Astros batter, he struck out at least once. Moving the Needle: Mike Stanton opens the scoring with a two-run double, +.250 WPA. He might not hit for average, and he might not have the highest of on-base percentages, but Mike Stanton can crush a baseball. This time he didn’t send one out of the park, but instead drilled a double into the left-center field gap, scoring both runners on base and giving the Marlins a 2-0 lead in the fourth. On the season Stanton has 83 hits, and more than half of them, 42, have gone for extra bases. Clay Hensley: 5 IP, 1 H, 0 R, 2 BB, 3 K. Hard to ask much more from a guy coming off the DL. Willie Harris: 2 for 3, 1 2B, 1 BB. He and Stanton had the only extra base hits of the game. Moving the Needle: Neil Walker‘s single sets up the Pirates’ two-run fourth, +.120 WPA. 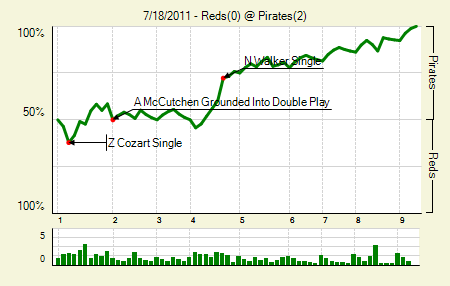 Both of the Pirates runs scored on outs, so it’s the setup hits that get the attention. The fourth started when Chase D’Arnaud singled, and continued when Walker did the same. Since Walker’s went to right, D’Arnaud took third, and the throw allowed Walker to move up. That came in handy, because he then took third on Andrew McCutchen’s RBI ground out, which put him in position to score when Matt Diaz hit a fly ball. Charlie Morton: 5 IP, 3 H, 0 R, 2 BB, 3 K. One of the walks was intentional, though he did hit two batters. It’s odd to see him pitch only five, especially since he hit for himself in the bottom of the fifth (he drew a walk). But he did have a start skipped due to fatigue just a few weeks ago, and last time out he got killed in the sixth after pitching five scoreless. Tony Watson: 2.2 IP, 0 H, 0 R, 1 BB, 1 K. If your starter is only going five you need some quality middle relief. I’m not sure Watson is that — he made his major league debut in June at age 26 — but he held it together last night. 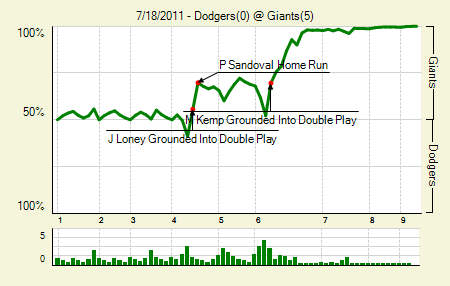 Moving the Needle: Matt Kemp squelches the Dodgers’ chances with a double play ball, -.174 WPA. The game didn’t get out of hand until the bottom of the sixth. In the top half the Dodgers were down only one run, and they opened the frame with a pair of singles. That brought Kemp to the plate, but on a 1-0 pitch he got on top of one and grounded it right to third. The ball went 5-4-3, leaving just the runner on third with two outs. A pop out ended the inning, and the Giants offense put four on the board in the bottom half. Ryan Vogelsong: 6.2 IP, 7 H, 0 R, 1 BB, 5 K. At 2.02 he is the NL ERA leader, but at -1.48 he’s just second in ERA minus FIP. The top honors there belong to Jeff Karstens. Pablo Sandoval: 3 for 4, 1 HR. His solo homer started the scoring, and he added a hit in the big sixth. We hoped you liked reading The Morning After: Game Recaps for July 18th by Joe Pawlikowski! Morton pitched five because there was a rain delay in the top of the first that lasted for an hour and a half. Surprised he even came back out. And the rain delay was in the middle of an at-bat; it was 1-2, I think, with the bases loaded and two out when lightning hit and they cleared the field for an hour and a half. When he came back he managed to get a force out on a very nice play by d’Arnaud. He also threw a ton of pitches in the first two innings (I think he was at 30 at the rain delay) so even though his pitch count wasn’t that high, it wasn’t that surprising when they pulled him. He also wound up running the bases in the fifth. The intentional walk didn’t start intentional, btw; he went to two balls on the hitter and then they finished it intentionally.